Here we see a prime example of why yeshivas need better math. This sign makes no sense no matter where it's hanging. Whether where it is now, on ave M or even if it would be a block away from the store. Does the sign mean that the store is so great that after taking the subway there, you'll never want leave? 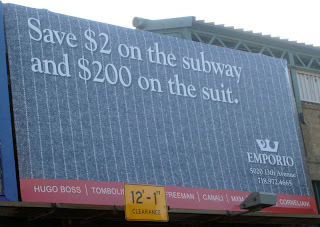 Or, perhaps, the prices are so bad that after your "$200" discount, you wont have any money left for the return trip? Is the sign actually 18-22 years old, when the subway was $2, and was stuck in interdimensional limbo until now? Does the genius who came up with this sign know that the bus costs the same as the train. No matter how you look at it and what logic you use, this sign makes absolutely no sense. Chuck another one for the great yeshiva edumacation system. Looks like Blogger finally added the one thing that was missing from the new inline comments form. To the right of the "preview" button there's now a subscribe link. This not only adds subscription to the inline comment form but is a great improvement over the current way of subscribing to comments. Now you don't need to leave a comment to subscribe to a post's comments. My Yom Kippur besomim. 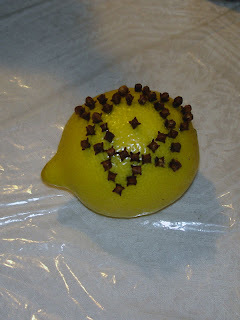 I find a lemon with cloves stuck into it at random absolutely boring. It's so much more fun to make some kind of a design, like my lopsided magen david. While you can make shehecheyanu on the same boring starfruit or sabra, it's not so hard to actually get something new and weird. The scaly banana, don't remember what it's called, tasted like pineapple, but, left a stinging sensation on my lips and in my mouth. 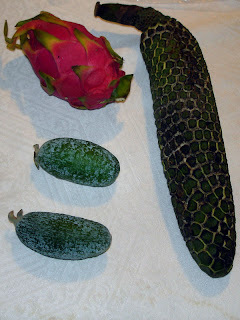 The dragon fruit was very good. It tasted more or less like a kiwi. The other fruit, don't remember the name, was somewhat sour. The centerpiece of my semanim is always the rosh kever. 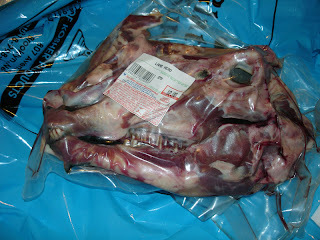 Unlike the toothy lamb's head, I find the whitefish head absolutely disgusting. 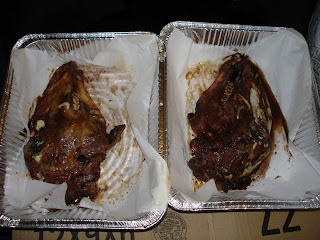 A lamb's head is more proper, tastes better and is a great way to freak out guests. And yes, I do make everyone eat a piece. Last night, I spent a couple minutes looking at the calendar in Mountain Fruit, trying to figure out what's wrong with it and why are they open on shabbat morning and on Yom Kippur. Maybe it took me so long because it was 10PM, maybe because it was something I've never seen before. The bloody thing was right to left!!! Though at least they used Arabic numerals. I've gotten calendars from different organizations asking for money and all of them were left to right, even if everything was in Hebrew. I've never seen something like this before and never want to see it again, especially not in a store, showing store hours. Are calendars in Israel printed like this or is this a very late, or very early, April Fools' joke.